We’ve seen this done before, and done better. Man of the Year doesn’t come close to Levinson’s direction of David Mamet’s wickedly humorous satire Wag the Dog and lacks the warmth of Dave. It falls apart in the second act, seemingly written and directed by a studio exec’s retarded grandson, as the film losses all it’s momentum as the comedy is shelved for a thrill-less thriller. Tom Dobbs (Robin Williams) is a comedian with his own late-night political show, think Bill Maher or Jon Stewart amped up on caffeine. An offhand remark by a audience member begins a series of unusual and unbelievable circumstances leading this funny man to become the President of the United States. It has a perfect set-up. As Dobbs runs just to stir the pot, which no one takes seriously, Elanor Green (Laura Linney), an employee of the Diebold-like maker of the new voting machines, discovers a slight flaw in the system. When she presents her findings to the CEO she is told the problem is being worked on and will be corrected. When Dobbs wins the election she realizes the company has lied and sets out to expose what happened, only to be discredited by the company’s shady lawyer (Jeff Goldblum) and practices. In her quest she discovers something shocking, despite the fraudulent vote and rigged election, maybe, just maybe, the right man won afterall. 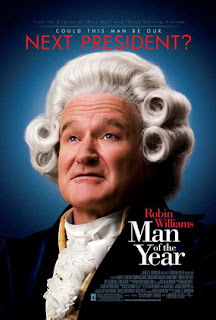 Barry Levinson creates the perfect vehicle for Williams to go crazy and have something legitimate to say about politics. He then surrounds him with a posse (Christopher Walken, Lewis Black) to bounce his unique humor off of. The problem arrises once Dobbs becomes President. The ride was so much fun and Levinson doesn’t know how to keep it going. Instead he bogs the film down in a pretty average, and more than mildly-confusing, political thriller as the company’s disinformation campaign takes over the entire film, leaving Williams speechless (not a good sign), Linney haggard (not appealing), as the film’s humor is hijacked halfway through (that’s bad, especially for a comedy). It never gets back on track. A trainwreck though, better than the last time the pair teamed-up ( 1992’s Toys), still has more than its share of problems. The uneveness of the film given it’s tonal shift in the second half just deflates the film and charatcters putting comedic actors in a thriller that lacks any real thrills. I’m still, marginally, recommending it to you for the first half of the film, but after you’ve watched the scene where Williams dresses-up as George Washington you might want to get up and see what’s playing next door.